Fluorescent probes, glowing tags that can be attached to a variety of biomolecules, are ubiquitous in the study of biological systems. Chemists at Carnegie Mellon University have developed a new polymer-based probe, inspired by a bottlebrush, that can hold thousands of fluorescent molecules, making it 10 times brighter than current technology. Brighter probes like this will allow scientists to detect very low levels of protein expressed in cells. Their results are published in ACS Central Science. Researchers use fluorescent probes to see particular cells and their molecular components, such as proteins and nucleic acids in living systems. Most commonly, probes consist of an antibody specific to a protein expressed by the target cell and a secondary antibody attached to a fluorescent dye molecule called a fluorophore. When the antibody complex binds to the associated protein within or at the surface of the target cell, the fluorophore lights up. If the protein is expressed at a low level, the fluorescence can be dim, making the protein difficult to detect using standard imaging techniques. To overcome this, researchers have tried to amplify the fluorescent signal by attaching dye molecules to the secondary antibody. However, when too many fluorophores are close together, they self-quench, reducing the brightness of the signal. Researchers in the labs of Krzysztof Matyjaszewski, the J.C. Warner University Professor of Natural Sciences, Bruce Armitage, professor of chemistry and co-director of the Center for Nucleic Acids Science and Technology, and Subha R. Das, associate professor of chemistry, combined their expertise in polymer synthesis and DNA chemistry to create a brighter probe that allows scientists to monitor sparsely expressed proteins. The chemists found their inspiration in the many bristles of the bottlebrush. The group created brush-shaped polymers with side chains that resemble bristles. 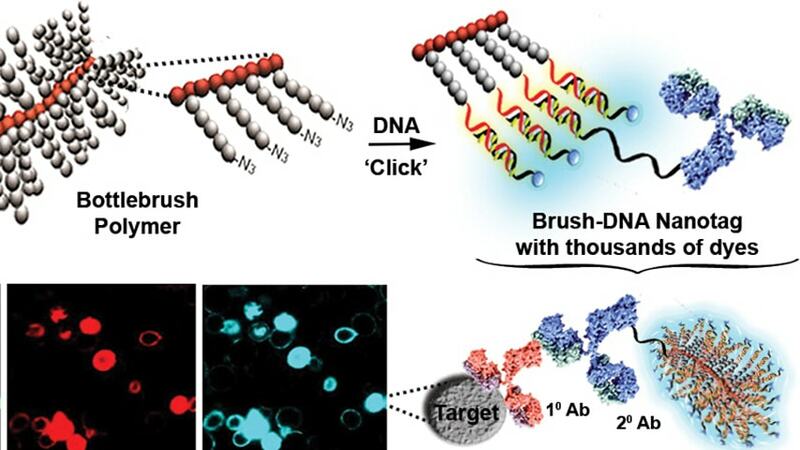 They attached double-stranded DNA to the tip of each bristle. The DNA acts as a scaffolding for special fluorescent molecules that bind only to the inside of DNA’s double-stranded structure. This sequesters the fluorescent molecules on each bristle of the brush, preventing the molecules from quenching. The bottlebrush structure can then be attached to an antibody, making a fluorescent nanotag that has a signal 10 times brighter than existing technology. The design permits researchers to attach different colored dyes to the DNA bristles, allowing researchers to look for more than one protein at a time. The authors note that, with additional tweaking, the brushes also could have other uses, including as a delivery vehicle for cancer therapeutics. The research was funded by the National Science Foundation (DMR 1501324, DMR 1407645) and the DSF Charitable Foundation.